It’s long past the time to put your denim cut-offs and strappy tops away, summer is well and truly behind us. It’s time to embrace the cold weather and all the joys that winter has to bring; it’s really not as bad as you think! There are some good things about winter; the fact that oversized knit jumpers cover a multitude of sins resulting from too many pumpkin spiced lattes (thank you Starbucks) is just one of them. But one of the best things about winter is that it’s a time for wardrobe overhauls, out with the old and in with the new and all that. It’s all about accepting that your budgets going to have to take a hit because, let’s face it, shopping for your new season winter wardrobe is so much more expensive than in the summer; there’s just so many layers! We’ve been lusting after beautiful wintery items since august; after all there is only so long a girl can rock about in leather shorts before things get a little tired. Winter dressing is so much more interesting. And all of the new season trends have made getting dressed in the morning so much more fun. With Saint Laurent’s punk vibe talking to our inner Avril Lavigne and Simone Rocha bringing out the mean girls in us (On Wednesday we wear pink) we don’t know where to start. We’ve noticed such a stark divide in some of this season’s biggest trends that we’re finding it hard to define our new season style; everything’s getting a little confused. 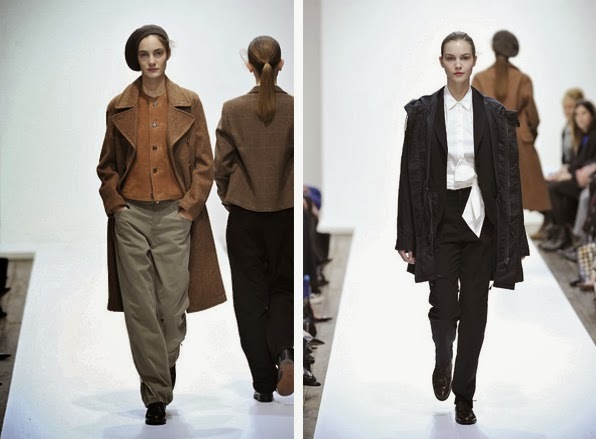 Some of our favourite designers are continuing to present collections that embody a chic androgynous aesthetic that’s become increasingly popular over the last couple of seasons. But on the other hand many designers such as Roksanda Ilincic, Simone Rocha and Calvin Klein have been embracing a new found love of everything feminine. The thing is, unless you have an unlimited budget, buying a pair of masculine tailored trousers and alongside hyper-feminine full volume skirt means that you’re going to end up with a wardrobe where nothing that you own can be worn together. I’m afraid you’re going to have to pick a side here. 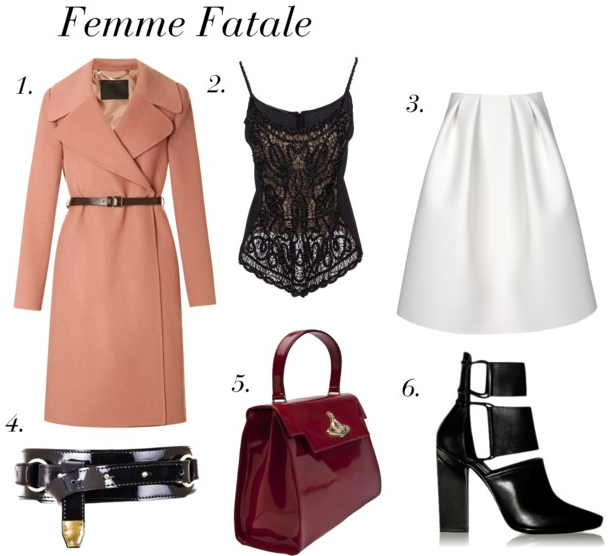 Will you opt for a Hitchcock style femme fatale wardrobe that would put Christina Hendricks of Mad Men to shame or do you prefer to play things a fast and loose with a relaxed high fashion androgynous look? 1. Marc Jacobs Double Faced cashmere belted coat - £1,865 – Modaoperandi.com – This season’s go to colour has to be pink so why not introduce the rosy hue into your everyday repertoire with an eye catching statement coat. 2. Alberta Ferretti Top - £455 – Yoox.com – Channel a little of Dolce & Gabbana’s sumptuous glamour with a little bit of lace in the form of a camisole or with this amazing top from Alberta Ferretti. 3. Acne ¾ Length Skirt - £530 – Skirts are worn long and full this season to emphasise the female shape, opt for a style that finishes just below the knee for a chic vintage vibe. 4. Doramojezes - patent leather waist belt - £180 – notjustalabel.com – Draw attention to a narrow waist with a belt, this patent leather style will toughen up an otherwise softer look. 5. Viviene Westwood – Foldover Flap Hand Bag - £639 – Carrying a ladylike handbag is the easiest way to add a feminine twist to any ensemble; we love this elegant Vivienne Westwood style. 6. Alexander Wang – Makenzie Leather ankle boots - £280 – Toughen up any look with a pair of strong boots, these Alexander McQueen ankle boots are the perfect combination of masculine and feminine.